Charles Holder speaks on behalf of Tent City Voices Heard Wednesday, Sept. 21. UPTOWN — A group of homeless people who have been camping out under Uptown's viaducts for months have organized a neighborhood group that will fight for their rights against city restrictions. Uptown's "Tent City," concentrated mostly under the neighborhood's viaducts at Lawrence, Western, Montrose and Foster avenues, hosted a press conference Wednesday under the name Tent City Voices Heard, which was referenced in a related press release as "the homeless encampment residents' group." Charles Holder, 47, a homeless Uptown resident for five years, said the association is advocating for the basic rights of its members. "The bottom line is, we are human too," Holder said. "We eat, we sleep, we breathe just like everyone else." While the city has vowed not to destroy tents, activists say "that isn't good enough." 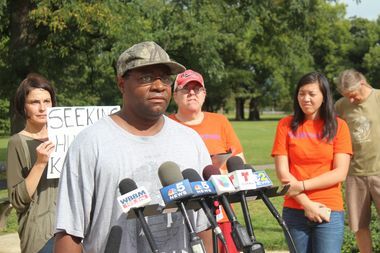 Tent City Voices Heard members spoke out Wednesday against the seizure of their property by the Chicago Department of Family and Support Services (DFSS), which has been responsible for sweeping clean-ups of the viaducts in the past, confiscating tents, blankets and bedding and other belongings from the sidewalks. "The tent [confiscations] have become a crisis for us," said Maria Murray, a viaduct encampment resident who expressed worry about approaching winter weather. Tents are vital for providing protection from the elements and storing the homeless' few personal items, which for Murray include clothing and prescription medications, she said. With no income, like many viaduct residents, Murray said she is "hard to house." "I'd love to get a job," she said, "but it's hard to get an interview with three garbage bags." The public address Wednesday was co-hosted by the Chicago Coalition for the Homeless, and ONE Northside, a collective of advocacy groups. Both have worked with Uptown's homeless in the past on a variety of initiatives. Speakers representing Tent City Voices Heard decried "frequent and unnecessary 'cleanings' of the viaducts" in recent months for accomplishing little beyond "mak[ing] life more difficult for the homeless people" in a press release. Tent City Voices Heard characterized their interactions with the alderman's office and the city as unproductive, despite the recent launch of a pilot program that promised in June to find permanent housing for 75 homeless Uptown residents. "No one has the nerve to really talk to us," Holder said. "We go to the alderman's office, he tells us to go away." Wednesday's press conference preceded a scheduled meeting between the homeless neighborhood association and Lisa Morrison Butler, commissioner of DFSS. During the meeting, Butler updated the group on the pilot program and addressed questions about the cleanings, which will happen weekly for six weeks, along with twice-a-week garbage pick-up. When DFSS started the pilot program, Butler suspended the cleaning of the viaducts to engender trust between the residents of the encampments and the city, which was missing, and vital to housing efforts, she said. But the result was an increase in garbage and human waste, motivating DFSS to end the forgiveness program. Along with reinstated garbage pick-ups, the city will also be cracking down on "over-sized items" like recliner chairs that crowd the viaducts where people walk. For now, tents won't be confiscated, Butler said. "There's a difference of opinion [regarding tents] among some important folks," said Butler, adding the tents would be allowed at least until Oct. 14, the last scheduled cleaning day, which "gives us time to continue that conversation." The City and the Chicago Coalition for the Homeless are at a "stalemate," Butler said. While the City believes that "from a legal standpoint" the tents are not allowed, the coalition maintains that they are, she said. Butler will revisit the tent issue at a meeting still being scheduled after Oct. 14, she said. Uptown's homeless population was recently logged by the city at 73 people, up from 41 last year, though those numbers are constantly in flux. The pilot program launched in June promised to find permanent housing for 75 of Uptown's homeless residents, but Tent City Voices Heard members say the city has failed to deliver on that promise. Forty people have been have been housed in the pilot program, 32 in bridge housing and 8 in permanent housing. Fifty-one people assessed in April are now off the street, while 11 people have been deemed inactive, Butler said. "We know who those eleven individuals are. We know them by name and we know why they are inactive," said Butler, adding that some have been incarcerated and others have moved out of the state. While the city failed to reach their goal of housing all individuals within 90 days, the federal guideline of how long the process should take, Butler said they were still ahead of Chicago's normal time span, which is usually around 235 days. The goal now is to house the remaining participants by the end of November, which would fall between 180 and 210 days since the start of the program, she said. "That's still way too long," Butler said. Donald King is one of the pilot program's success stories. Now living in an SRO on the North Side, he said "I'm happy I got it." "Last year was my first winter on the street. I couldn't do that no more," King said. "I won't be on the street this winter, and that's great." While King hopes the program will help house the homeless citywide with more urgency than previous years, he asked the city to continue to work towards housing those under the viaducts. 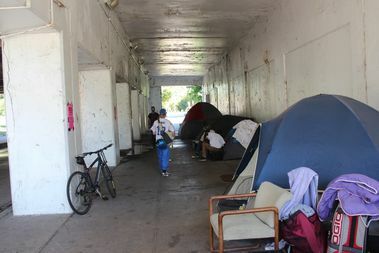 The City plans to continue the program next year, but will likely focus on different encampments around the city, like the one at Kedzie Avenue and Belmont Avenue in Avondale, and Lower Wacker Drive, Butler said.